The homely and comfortable Villa Archontariki is set on the edge of the little village of Kouses, approx 60 km from Heraklion and 4 km from the glorious ancient Minoan Palace of Phaistos. It has a wonderful view over the Messara Plain. The house surrounded with pretty gardens is set in grounds of 2000 sqm. 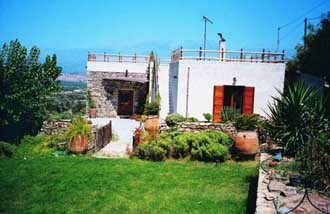 It was built in 1932 and restored and enlarged in authentic Cretan style by the current owner. This house, of 100 sqm in size, is suitable for up to 4-5 people and has a bedroom with a stone built in double bed, shower/wc and a veranda with garden views. There is a split-level living room with a fireplace and seating area on one level and a sleeping area with stone built in beds on the other level. The villa also has a central heating system, a fully equipped kitchen, another shower/wc and a telephone for incoming calls only. Most importantly the beautiful long stretch of golden sandy beach at Komos is but a short drive away, approx. 5 km, and the famous sandy beach at Matala just a little further south. There is a mini market in the village of Sivas with is about 1 km away.